The Friendship Archway is next to the commercial space with what may be the city's most expensive rent. 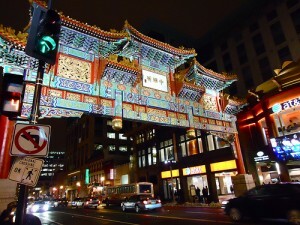 The storefront with the highest retail rent isn’t in Georgetown or Dupont Circle — it’s in Chinatown. That’s according to DCMud, which reports that the only vacancy on the corner of 7th and H Streets NW is going for $250 to $300. That’s a lot. Georgetown businesses typically pay $100 to $120 per square foot, and Union Station, which currently has the city’s highest rates, leases space for about $200 per square foot, DCMud reports. Although many of Chinatown’s most visible businesses are national chains, the neighborhood still has a number of small, family-owned restaurants, harkening back to a time when Chinatown still had a sizable immigrant Chinese population. But given the increase in retail rates in the neighborhood, those longing for a resurgence of mom-and-pops joints may want to look elsewhere. Corner of 7th and H Streets NW.